Last week, I had the innate pleasure of being one of the first to view the brand new Disney/Pixar movie “UP“. The Wadsworth’s Aetna Theater in Hartford, Connecticut held a free screening that even preceded Cannes. The film revolves around the character Carl Fredericksen (voiced by Ed Asner), a 78 year old curmudgeonly balloon salesman who’d lived his life dreaming of an adventure to South America with his wife Ellie. As children, they’d idolized the adventurer Charles Muntz, and Ellie longed to follow in Muntz’s footsteps to Paradise Falls. A beautiful 5-minute montage details their lives together, though sadly they never embark on this dream together. Ellie passes away, leaving Carl with a scrapbook that eventually brings about a tremendously moving moment in the film. Carl is about to lose his beloved home, which holds a lifelong of memories of life with Ellie. As development is surrounding his house, he’s finally forced to make a decision to save his home in the only way he knows how – with thousands of balloons, taking Carl on the adventure South America that he and Ellie had always hoped for. His journey is shared with Russell, a persistent 8 year old Wilderness Scout who has been trying to “help” Carl in order to earn the last badge needed for his Wilderness Scout sash. The badge is for “assisting the elderly”, though Carl needs no assistance. Russell starts out an annoyance, but they forge a special bond by the end of the film. The scene where Carl, or “Mr. Fredericksen”, as Russell calls him, sees Paradise Falls for the first time brings to memory the moment in Ratatouille where Remy gets his first look at Paris. Paradise Falls is based on an actual place in a remote area of South America that Pixar team members traveled to for inspiration – you can find a photo of the team in the new “UP” display at Disney’s Hollywood Studios in Florida. This is where, in the film, Carl and Russell encounter Kevin, a delightful, giant bird with a penchant for chocolate. John Lasseter subscribes to Walt Disney’s theory that “for every laugh, there should be a tear“. “UP” delivers many laughs, but bring a few tissues as well. This Pixar film is no different than others in delivering memorable characters, with a lot of heart and real emotion. If there is only one quibble I have with the film – a minor one – the music didn’t stick with me after the film was through. I guess I’ll have to see the film again to make sure it does. The Pixar short “Partly Cloudy” shown prior to “UP” is a winner too – but would you expect less from Pixar? 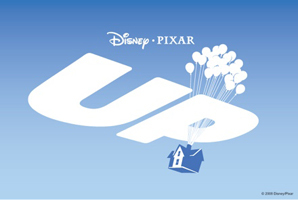 “UP” is in my top 3 Pixar films. I can’t recommend it highly enough.